Recently, you may have seen an article about Duke’s pilot project with Sakai hosted at UNC-CH. 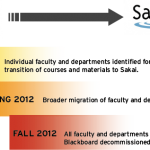 Sakai is expected to replace Blackboard as Duke’s centrally managed learning management system over the next several years. Duke’s Sakai Pilot website will be updated as the pilot progresses. You are invited to leave feedback and comments using a link near the bottom of the page on the pilot website. The Duke Sakai Pilot planning team, a group representing various academic and administrative units, is currently working on plans for testing and implementing Sakai and for communicating about the Sakai project. By the end of the spring semester, the group hopes to have plans for the timing and process of moving Blackboard content to Sakai, training and support needs, and engaging the Duke community in long term planning and improvements of Duke’s course management system.